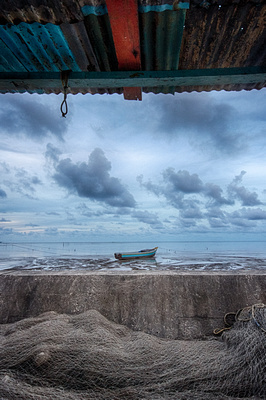 On a recent photo-walk with Nikhil and Sharon on the seawalls up the East Coast of Demerara, I found myself looking at the scenes around me and shooting without really thinking too much about it, almost on automatic. I saw things to photograph, they caught my eye and I took a few snaps. I wasn’t inspired, and I thought to myself that I’d be coming away with something “normal”, something that I would be happy with but not overjoyed. On the walk back to the vehicle, I happened to walk under a fisherman’s shed, and the scene that caught my eye was different in a few ways from all that I had seen, nothing spectacular, but just different enough for me, and I stopped, took the time to set up the camera for a few bracketed exposures, and took two sets of exposures for later HDR-processing. This was the result: At Rest. Click on the image above to see it better in the Gallery.